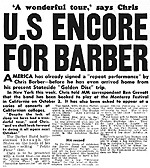 In this part of the website you'll find lots of rare archive material related to the Barber Band over its fifty-years-plus history. We begin with an important and fascinating document, written by Chris's old friend Brian Rust, and published in 1957: A Biography, Appreciation, Record Survey, and Discography. This was the second publication in what by then was a six-volume series published by the National Jazz Federation: in this series the Barber Band were in the fine company of George Lewis, Gerry Mulligan, Ken Colyer, Ruby Braff, and Jimmy Rushing. "Chris Barber has never resorted to gimmicks to sell his music: unless, of course, in these days of everyone striving to be different for the sake of it, it is a gimmick to play tuneful jazz that includes less familiar numbers as well as the well-worn ones, in an unassuming, warm-hearted fashion, making no desperate effor to copy anyone, old or new." ".... there seems no reason why Donald Christopher Barber, having arrived at the top of his particular tree, should not remain there indefinitely." A Biography, Appreciation, Record Survey, and Discography, by Brian Rust. As a sort of "companion" to the Brian Rust booklet, compare a rather more objective -- but generally favourable -- critics' view of the Barber Band's music at around the same period: an excerpt from the 1960 edition of Jazz on Record: A Critical Guide. 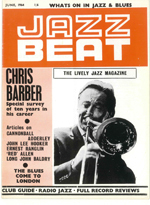 Matrix Jazz Record Research Magazine, December 1956: Contains of discography of Chris Barber records up to July 1956. Cartoons and doodles by Monty Sunshine. Our friend and collector Dr. Peter Brennecke from Germany was lucky to find this copy of Music Mirror from December 1956. A letter to Ivan Spring from the Chris Barber Club, dated 17th January 1957, concerning the personnel on an EP. Unfortunately, the information provided was not entirely correct, as the bass player was Jim Bray, rather than Micky Ashman. The Case for the NJF: A leaflet published by the National Jazz Federation in the mid- to late-1950s. Thanks to discographer Gerard Bielderman, here is a 1958 magazine from the Dutch Chris Barber Club. Again thanks to Gerard Bielderman, here is the second (and last) magazine from the Dutch Chris Barber Club. Three items from Jazz News, 1958. Two Chris Barber music books from the latter part of the 1950s: twelve tunes in all, plus some photographs. The scanned pages include one sheet of music: the first part of Merrydown Rag, along with a short excerpt from the 1954 recording. You can also download a PDF file of the sheet music for Hushabye. Various articles from Melody Maker, 1959, contributed by Gerard Bielderman. The ticket to the left was for one of the most famous concerts ever played by the Chris Barber Band. 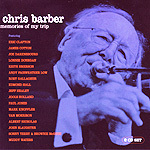 Part of the concert was recorded and originally issued on the 12-inch Columbia LP, Chris Barber International, Volume 1: Barber In Berlin. Another Berlin concert ticket, from 1961, is posted on the same page. 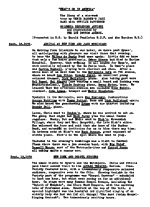 Two documents from the Barber-Purser archives giving detailed accounts of the band's Second North American Tour from September to November, 1959. Articles and photographs from Jazz Journal, February 1960. Here are the cover and a record review from Jazz News, 5th July 1961. Sheet music for Revival and Lonesome. An article from the British magazine, Today, published in August 1961 at the height of the "trad boom". Several books were published at the height of the "trad boom" in the UK in the early 1960s. Here is a short chapter from one of them, Trad, by Ivan Berg and Ian Yeomans. A book that was quite similar to the previous one, and published at around the same time, was BBC DJ Brian Matthew's Trad Mad. In this case the longer chapters were devoted to the bands that Matthew saw as being at the top of the "trad tree" -- Acker Bilk, Kenny Ball, and the Temperance Seven -- but there was also a quite substantial and informative section on the Barber Band, which gives as good a snapshot as any of the place of Chris Barber in the "trad boom" of the early 1960s in Britain. 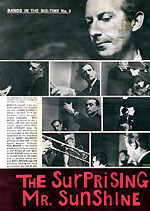 Cover of a Sunday Times Magazine from June 10, 1962, featuring an article on British jazz. "The Barber of Tradville" -- Photos and an article from a British teen magazine, 1962, at the height of the British "trad boom." "The Surprising Mr. Sunshine" -- Photos and an article from a British teen magazine, 1962, at the height of the British "trad boom." Keith Scott (England) has kindly provided scans of two items associated with Alexis Korner's Blues Incorporated from 1962. Will the "Trad Jacket" make a comeback? Is this the perfect gift for Christmas? We report, you decide. In defence of the banjo: a short interview with Eddie Smith from the Melody Maker, some time in the early 1960s. Here is a magazine article from about 1963 or 1964 written to publicize the LP, Best Of Both Worlds, featuring tracks with guests Louis Jordan and Edmond Hall. 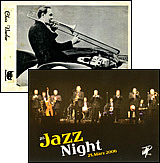 Chris Barber's Jazz Band played regularly at Motor Car Events in England. The 1964 RAC European & British Grand Prix is documented on a VHS cassette as well as on a DVD. You will find as well an excerpt of the Chris Barber title "Brands Hatch"
The Chris Barber Band visits the army, 1967. 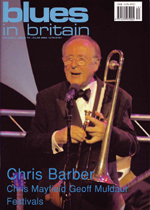 The Chris Barber Jubilee Album -- a celebration of Chris Barber's first 25 years as a bandleader, in the form of a beautifully illustrated booklet to accompany the six-LP set released in 1974. Ottilie Patterson Publicity Booklet, early 1980s. Article from a British blues magazine, 1988, featuring an interview with Chris Barber. "I wasn't the Editor at that time, but I was a subscriber and have a collection of back copies. So I have scanned both the articles and the front cover of Issue 46 and attach them to this email. 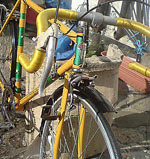 The articles were published in March and April 2001. 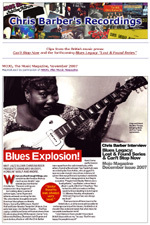 The magazine is now called Blues In Britain and we'd be happy to let you put the interviews on your website and would be grateful if you could add our website address to the page(s) - www.bluesinbritain.org. Thanks Paul, for your kind permission to publish this rare item here. An article in Dutch, written in 2004, looking back to the recording of "Easy Easy Baby", from the 1959 LP, Chris Barber International, Volume 1: Barber In Berlin. Thanks to Hans Barth of the Netherlands for providing this article. Swiss newspaper article (14 October, 2004) about Chris Barber in Switzerland 1974/75, a double-CD from Lake Records. Chris Barber's Foreword to a book about "The Skiffle Craze" -- scans thanks to Chris Robins. Two newspaper articles -- March and April 2005. 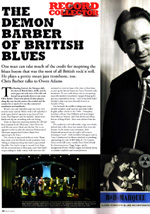 "Blues History" -- a 2005 article reproduced from fROOTS magazine: "Chris Barber formed his first band in 1949, set the scene for skiffle, and in the late '50s was responsible for introducing legendary blues players like Muddy Waters to the UK. Here he reminisces to Dave Peabody about that era, setting right a few myths along the way...."
Two publicity postcards -- one from the 1950s, the other from 2006. Article from a German newspaper, October 2006. Archive of the Chris Barber and Pat Halcox 75th Birthday Guestbooks. Julian Purser found this German film poster. 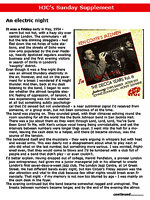 Article from the National Jazz Archive Newsletter, October 2006. Article from a German newspaper, May 2007. An electric night: Brian Harvey's personal account of the break-up of Ken Colyer's Jazzmen and the beginning of Chris Barber's Jazz Band in 1954. BBC Music Magazine's review of Can't Stop Now. 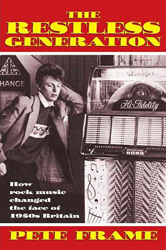 Clips from the British music press: Can't Stop Now and the forthcoming Blues Legacy "Lost & Found Series"
Review of Pete Frame's The Restless Generation: "How rock music changed the face of 1950s Britain". Article from The Worcester News, 23 November 2007. Article from The Southern Daily Echo, 5 December 2007. 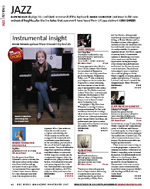 Article from Blues In Britain, December 2007. "The Demon Barber of British Blues" -- article published in Record Collector magazine, January 2008. Interview published in Mature Times, April 2008. 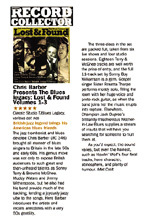 Five-star review of the Lost & Found CD set, from Record Collector. John Westwood was the drummer in one of Chris Barber's first amateur bands. John shares his reminiscences of the earliest days of British traditional jazz in Some Recollections from the Days of a Mis-spent Youth. Because it's written in Danish, Chris Barber: 50 år med en levende jazzlegende may not be accessible to many visitors to the Chris Barber website. Don't let that deter you from acquiring a copy, however: the large number of pictures alone -- many of them rare and not published elsewhere -- are worth the price of the book. 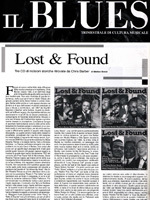 This Swedish article from the magazine Red Hot Rock is aimed at publicizing the Blues Legacy Lost & Found CD-set, and includes an extensive interview with Chris. "Sister Rosetta Tharpe, the pioneering gospel musician and instrumentalist, finally has a gravestone marking her resting place at Northwood Cemetery in Philadelphia. Since her passing in 1973, the gravesite of Sister Rosetta had been a barren plot lacking any memorial. Today, a beautiful, rose-colored monument bears respect to one of America’s most influential artists of the 20th Century..."
This is an historical curiosity rather than strictly an item from the Barber-Purser archives, but nevertheless we thought it might be interesting to fans: the sale (for charity) on eBay of one of the bikes used by a racing team sponsored by Chris in the 1960s. The Lost & Found CD Series has arrived in Italy! Here is an article from the Italian magazine "il blues". Archive of messages to Chris on the occasion of his 81st birthday in April 2011. Archive of messages following the passing away of John Slaughter on August 15, 2010. A review of two books, I Feel So Good and Talking Music. Ferdie Favager, who was a member of Chris Barber's New Orleans Jazz Band in 1950 and 1951, recently passed away. Peter Brennecke, a German collector and follower of the band for many years, came across a copy of the June 1964 issue of the Jazz Beat Magazine. 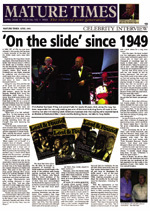 In this article Chris Barber talks to Peter Clayton ten years after the formation of the Chris Barber Jazz Band.